" ).insertBefore( "#edit-field-participant1-mr" ); // jQuery( "
Building a strong Credit Portfolio comprising of projects and programs in all three funding windows of SDF. Publication of knowledge products related to significantly important issues in SAARC Member States. Eminent delegates from Governments of SAARC Member States, various Multilateral Development Banks, Regional Financial Institutions, Scheduled Commercial Banks, Public Sector, Infrastructure Development Agencies, Donor Agencies, Civil Society Organization and other Development Partners are expected to participate in the prestigious conclave. Various thematic areas and opportunities to co-finance projects in Energy, Transport, Environment, Agriculture and Allied sectors, Trade and Commerce, and Information Technology under the Economic and Infrastructure Windows and projects in Poverty Alleviation, Human Development, Health, and Education under the Social Window in SAARC Member States shall be discussed and deliberated in the Conclave. SDF proposes to launch its Social Enterprise Development Program (SEDP) in the Conclave. Micro Small & Medium Enterprises Program (MSME) is also expected to be launched shortly in all SAARC Member States. 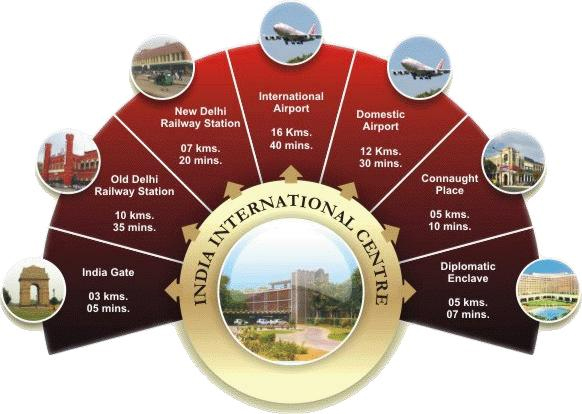 Airport Distance from the Venue –IIC : Venue is located about 16 Km from Terminal 2 & about 12 Kmfrom Terminal 1 & 3 . Approximate Travelling Time (30-45 Min). Railway Station Distance from the Venue –IIC : Venue is located about 7 Km from New Delhi RailwayStation. Approximate Travel Time (20-30 Min). Currency used in India is Indian Rupee. The current exchange rate is 1 USD= INR 67.46 (For notes). All major international currencies are accepted in Banks. Credit Cards / Debit cards are widely used in hotels/ markets. Foreign Currency can easily be exchanged at airport, hotel as well as from main markets. The event is poised to be an event of strategic and regional importance for South Asia. It proposes to harness potential opportunities in SAARC Member States and suggest a way forward for joint cooperation and partnership among the various development partners in line with the SAARC Development Goals. Disclaimer: The KPMG name and logo are registered trademarks or trademarks of KPMG International. Ms. Sania Akhtar, Senior Manager, Communication and Knowledge Management at sania@sdfsec.org (Cell No. : +975-17172909). Ms. Yamuna Dulal, Executive Secretary to CEO, SDF at yamuna@sdfsec.org (Cell No. : +975-17798976).